We’re now up to the ninth post in our consistently excellent methodology and narrative mini-forum, and this one was contributed by Noelani Goodyear-Kaʻōpua. Noelani is an Associate Professor of Political Science, with an emphasis in Indigenous Politics, at the University of Hawai’i at Mānoa. She has published on issues of identity, indigeneity and praxis in Hawai’i. Her first book, The Seeds We Planted: Portraits of a Native Hawaiian Charter School, was recently published by the University of Minnesota Press. Her second book, Ea: Hawaiian Movements for Life, Land and Sovereignty (Duke University Press, forthcoming), is a collection co-edited with Ikaika Hussey and Kahunawai Wright that explores late-20th and early 21st century Hawaiian organising for justice and self-determination. More recently, she has also become interested in the intersections of energy and food politics with Indigenous social and political health. Native novelist and scholar, Thomas King, reminds us that “stories are wondrous things. And they are dangerous.” In The Truth About Stories, he argues that’s all we are: stories. Empires are built on great stories. But on the other hand, anti-imperialist movements have also been motivated and sustained by narratives of personal and collective experience. In my own home—Hawaiʻi—we lived for almost a century with the narrative that the US takeover was legitimate and that Kanaka Maoli (Indigenous Hawaiians) did not resist the US annexation of the islands. This story is even memorialized in a statue of US President William McKinley that fronts the public high school in Honolulu named after him. He is portrayed stately holding a document. If one were to climb up onto that eight-ton statue and peer over McKinley’s shoulder, she would see ‘Treaty of Annexation’ carved into the bronze. And this is one of the dangers of stories; sometimes they are completely false. In fact, an approved Treaty of Annexation never came to President McKinley’s desk for his signature. The groundbreaking work of Noenoe K. Silva, in her book Aloha Betrayed, demonstrated that through a massive organized effort, Kanaka Maoli successfully defeated attempts to push a treaty through the US Congress in the mid-1890s. Over 38,000 Hawaiians defended their political sovereignty and recognized independence by signing petitions against the merging of the Hawaiian Kingdom and the United States. It was only when scholars began taking the narratives in Hawaiian language newspapers, Native oral histories and in Hawaiian songs and chants seriously that a century-long fiction was peeled back. The recovery of these stories has been incredibly generative for a new generation of scholars and activists who are now describing the relationship between the US and Hawai‘i as a prolonged, military occupation. Narratives can be powerful because they have material consequences. Stories can be written on the lands that we inhabit. I grew up flanked by the consequences of the ways imperial narratives are made reality and Indigenous narratives dismissed as archaic. I grew up alongside the largest sheltered body of water in the Hawaiian Islands, Kāneʻohe Bay, approximately 12.7 kilometers from farthest northwest and southeast points and about 4.3 kilometers wide. Kāneʻohe Bay contains one of the only barrier reefs in the Hawaiian Islands and can be quite shallow in parts, filled as it is with coral reefheads and sandbars. As such, it was Pearl Harbor, rather than Kāneʻohe Bay, that became the US Navy’s center in Hawai‘i because of the Navy’s need for deep water portage for its massive warships. 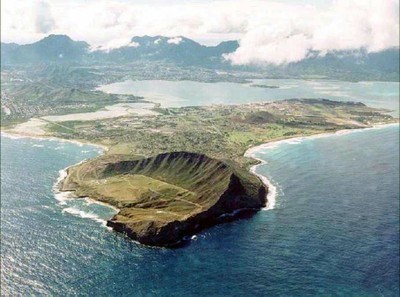 However, the south side of Kāneʻohe Bay is shielded by Mokapu peninsula and upon that headland, the US built a Marine Corps base complex that includes airfields, military housing, training and recreational facilities. For Native Hawaiians, the name Mokapu speaks to the significance of the place. “Mokapu” is a contraction of the words “moku kapu,” literally a “sacred and reserved land,” and it is known in Hawaiian mo‘olelo (narratives) as a site of godly creation and of human burial. I spent many hours playing in the shallows of the bay as a child. Frequently, over the sounds of my dog’s paws splashing through the water as she bounded after tiny fish, we would hear US military jets flying overhead or revving their engines at sea level. With my back to the mountains behind me, I would look to the right and see the distant silhouettes of huge buildings on the Marine Corps base at Mokapu. In contrast, to my left sat one of the largest remaining fishponds in the islands, built over 600 years ago and used continuously until the 20th century to provide for easy access to fish, especially during the winter months when deep sea fishing can be dangerous. On one side of me was an active site for the launching of death machines, and on the other, a largely forgotten site for the sustainable raising of fish, the most important protein in the Indigenous Hawaiian diet. By the late 1970s, when I was a small child, the 88-acre pond’s 1.3-mile outer rock wall was so overgrown with mangrove that I could not even tell what it was. The stories of the role this pond played in feeding the people of my community in earlier generations had been so silenced that I did not even know it existed, even when we stumbled through the tangled hedge and onto its wall. As advocates of narrative approaches to international relations and critical political studies assert, one of the benefits of narrative is that it can allow a reader or listener to feel, at a human level, various kinds of social phenomena that are typically described in cold and disembodied terms. For example, I could simply tell you that 25% of the land on the island I live on is controlled by the US Department of Defense and that US Pacific Command, headquartered at Camp Smith above Pearl Harbor, extends US power by claiming an “area of responsibility” that encompasses about half the earth’s surface and more than 50% of the worlds population. In its own official description, USPACOM’s reach stretches “from the waters off the west coast of the U.S. to the western border of India, and from Antarctica to the North Pole.” While stunning, these statements alone do not allow us to see and feel what such imperial reach means in people’s lives and lands. I came to the Critical Methodological and Narrative Developments in IR symposium in Toronto as an outsider to the field. One of the things that struck me most about the October gathering was how much suspicion and resistance my co-participants in IR face from the dominant voices and institutions in their discipline when they seek to use narrative approaches. My own work has been informed by fields that have long embraced the usefulness of narrative approaches and have explored the ethical imperatives of engaging narratives that emerge from marginalized communities. Indigenous studies methodologies recognize the fundamental importance of Native people narrating our own pasts, presents and futures. For instance, Gerald Vizenor emphasises the continuance of Native narratives of “survivance,” a term which emphasizes “renewal and continuity into the future” rather than loss and mere survival “through welcoming unpredictable cultural reorientations”. In Pacific Islands Studies, Epeli Hau‘ofa similarly transformed dominant approaches to studying the Pacific by abandoning conventional social science methods that posited a belittling, “islands in a far sea”-view of Oceania. Instead he showed the importance of story and of playfulness for articulating an expansive view of Oceania as “our sea of islands”. This storied view is empowering but not without critical examinations of power. Our short time together in Toronto only underscored, for me, the importance of further dialogue and collaboration between scholars seeking to make interventions in IR and those of us working in other fields but who also deal with narratives of peoples who are profoundly impacted by the material consequences of dominant international relations practices. Finally, I left the workshop feeling a renewed sense of urgency to think about a central question that should drive narrative methodologies: To what accountabilities do different narratives call us to attend? Or as Thomas King put it in The Truth About Stories, “Don’t say in the years to come that you would have lived your life differently if only you had heard this story. You‘ve heard it now.” What will you do with it? See Karl Kroeber, “Why It’s a Good Thing Gerald Vizenor Is Not an Indian,” in Survivance: Narratives of Native Presence (Lincoln and London: University of Nebraska Press, 2008), 25. Another interesting piece from “The Disorder of Things” on methods and IR. Well worth a look. A really powerful set of thoughts. Your comment, “To what accountabilities do different narratives call us to attend?”, which I must have also heard in the workshop, has influenced my thinking. It captures the ambiguity of narrative, but gives it sudden ethical shape. Stunning clarity. Thank you Noelani.